Review by Arron Clegg. (*Darkness Comes is also known as Darkfall). In his early days Dean spent a lot of time trying different genres out and attempting different writing styles. Nowadays he is more famous for writing about events and stories which are very feasible in the modern world. Sometimes these have modern sci-fi qualities mixed with a good old dash of horror and sometimes they are just plain, “oh my god that could really happen to me” scary. 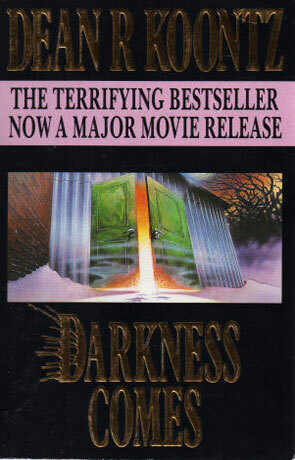 He has been likened and compared to Stephen King on many an occasion due to his ability to bring real life possibilities to the reader under an umbrella of darkness and this book is no exception. This book however is one of the old style Koontz books. It does bear a little resemblance of King’s early style, but also contains more dark content than even King has managed to muster, in fact reading closely you will see his influences are much more than King. You will see traces of Lovecraft, Poe and even Masterton among the lines that adorn the pages. In every way this is a book of a certain generation, written in the early eighties it certainly characterises a lot of horror that was written during that time. The book concerns itself with a string of strange inexplicable murders that occur within New York. The victims are all members of a large powerful mafia family and at first the police suspect that a rival gang are trying to kill them off in order to establish themselves. However several key facts to the case confound this theory. In a few instances the rooms where the bodies have been found have been locked up tight with no visible signs of entry, and secondly the victims seem to have been chewed up by some animal or beast not known to man. Further investigations lead the protagonist to a man named Lavelle, a powerful Bocor. Using his special voodoo powers and with help from the dark gods of Hell he has managed to open a gateway to Hell itself, calling forth minor demons, small and vicious to do his dirty work for him. These demons hide in the shadows like rats, stalking their prey. Unable to kill them with earthly conventional weapons, Dawson the story’s hero, must find another way to close the gates or risk it being flung fully open and releasing all the denizens of hell into the world and bringing on the ultimate darkness. Written on 14th June 2012 by Arron.